14. 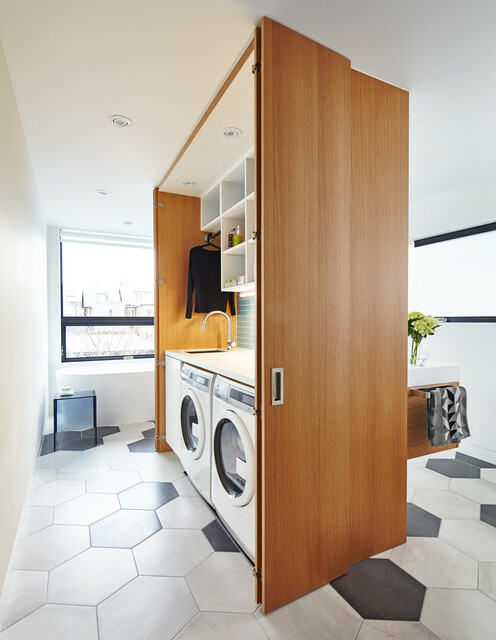 Location: Toronto, CanadaWhy we love it: The architect tasked with redesigning this 100-year-old home came up with an ingenious solution for how to add a laundry to the bathroom. So as not to lose the bathroom’s relaxed, sanctuary-like vibe, he installed the practical laundry zone inside a self-contained timber box, which can be hidden away behind folding doors. 16. Location: Toronto, CanadaFeatures: Combining your laundry and bathroom makes perfect plumbing sense. Doors to ensuite and wardrobe??? Where the rooms are back to back and combining them will give each area MORE space!